This month I was paired up with Megan. Megan writes a blog called St. Louis Dietician. Check out her blog for health tips. Ohio was part of the country impacted by the Polar Vortex at the beginning of the month and at the end of the month. Since the jet stream was further south than it usually was we got snow from Alberta Clippers. Three days straight we got snow during the day. Two of those days, I had stressful commutes home because of the road conditions. I was greeted with the box after that second commute. I absolutely loved the box so that put a smile on my face after my stressful commute. I’ve tried everything in my box. One of favorites was the dark chocolate mint bar. I eat only one block of it at a time so I can savor it. Another favorite was the peppermint tea. I love mint teas so this was perfect. I’ve been using the Greek Seasoning on air popped popcorn and coconut oil instead of butter. Yum! The olive oil granola was quickly eaten for breakfast. I love the combination of cashews and pistachios. In fact, I keep a container of almonds, pistachios, and almonds at work so I can eat some when my stomach growls. Thank you Megan for a great box. Dark Chocolate Mint vegan chocolate bar – Delicious! Peppermint Herbal Tea – This was/is great. I love a great mint tea. 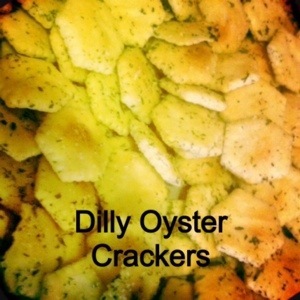 This is an easy snack to assemble and bake. They are also very yummy! They are also like Lay’s Chips. Once you eat one, you can’t stop. Mix the first 5 ingredients thoroughly in a big mixing bowl. Spread on a cookie sheet and then bake for 15 to 20 minutes. Stirring 2 to 3 times during baking. Cool and then store in an airtight container. I know’s it’s Tuesday and I’m finally typing out my menu for this week. This Arctic blast of cold air has really been playing with my sinuses. Last Thursday, I started out with a sinus headache. It didn’t go away on Friday so I called off of work. Saturday and Sunday were full of me stuffed up. Yesterday I went to work for half of the day and then went to a training (professional development) in the afternoon. Every time I would come in from the cold air, I would be stuffed up once again. So frustrating. Today we are at home because Ohio is getting wind chill values down into the negative 30’s. I’m doing okay today but that is because I’m not going out into the cold air. So what are we having for dinner? This week consists of eating foods that we have in the house. In August 2010, I posted a recipe for an All Star Muffin Mix. With this cold weather, I’ve been baking more than usual. Last night I decided to make a batch of it. Then I asked the Imaginative One what he thought I should use as add-ins. He suggested chocolate chips. Once they were baked, the Imaginative One had 1 and the Wee One had 2. I’ll say they were a hit. I’m going to give you the recipe 2 different ways. One using the All-Star Muffin Mix and one without the muffin mix. 1/2 c. melted butter (1 stick) – (Melt in the microwave for 1 minute.) – Allow the butter to cool down before adding to the mix. Add all the ingredients to a large mixing bowl. Mix together until all the ingredients are well combined. 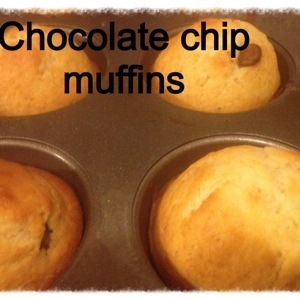 Pour into a muffin sprayed down with cooking spray or lined with cupcake wrappers. I put a 1/4 of a cup of batter in each cavity. In a large mixing bowl, combine the dry ingredients minus the chocolate chips. Add all the wet ingredients and chocolate chips to dry ingredients. In August of 2010, I posted an entry for Instant Oatmeal Mix. As we are experiencing another cold snap, oatmeal is a good way to warm up on a bitterly cold morning. I was pursing Yummy Life‘s instant oatmeal packets’ blog entry and found some good ideas for different types of instant oatmeal. Making your own instant oatmeal mixes is better than the Quaker or off brand instant oatmeal packets. You control the ingredients. Plus it doesn’t have preservatives. Using some of the ideas from Yummy Life and what I had around the house, I came up with an apple cinnamon instant oatmeal that is divine. Heat in the microwave for 90 seconds. Mix 1/3 c. oatmeal mix, 1/2 c. water, and 1/4 c. yogurt in a mason jar or a similar type jar. Make sure the lid is on tightly and shake up the mixture. Enjoy straight out of the fridge or allow it to warm up to room temperature before eating! I can’t believe it’s almost the end of January. 2014 is already flying by. Two more months until we are going to Disney. That gives me something to look forward to. We are going to use the crock pot all week again. It was so helpful getting supper on the table all week. It’s also going to be soup week. Three of our meals are going to be soups. Yum!!! My family loves soft pretzels. In fact when we go to the mall, we have to stop and get the pretzel sticks. My mom used to do that when I was a kid and now I do that with my two. If you don’t watch the Imaginative One, he will eat almost all of the pretzels. I love mine dipped in cream cheese or nacho cheese. He loves his dipped in chocolate. We also love going to the Target cafe and getting the cinnamon soft pretzels there. I’ve learned to get two of them now because once again the Imaginative One will eat the majority of the pretzel if you share with him. I’ve tried the cinnamon soft pretzel at Sam’s Club and was not too thrilled with the flavor. I made these on Monday, the sixth, which ended up being a temperature related snow day because it dipped down into the negatives. People in our area are not used to those temperatures and don’t have outer clothes to combat those temperatures. Both the Imaginative One and Hubby gave the soft pretzel nuggets a thumbs up. Yeah! In a large bowl, place the flour, salt, sugar, and yeast. Mix until combined. Add the water and mix well, adding more flour, as needed to form a soft, smooth dough that clears the sides and bottom of the bowl. Lightly flour the dough and place in a plastic bag; close the bag with room for the dough to expand. 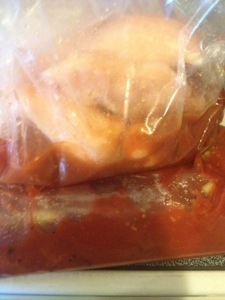 Let it rest for 30 to 60 minutes. Spray or line two cooking sheets with parchment paper. Transfer the dough to a lightly greased work surface and divide into about 4 strips of dough that are equal length. Allow the strips rest for 5 minutes. Meanwhile combine 1/2 c. warm water with the baking in a small bowl. Make sure the baking soda is completely dissolved. Cut each strip of dough into 6 to 8 pieces. Dip each pretzel nugget in the baking soda/water solution. Allow them to rest for 10 minutes. Bake the pretzels for 7-8 minutes (mine took 6 minutes). Remove the pretzels from the oven and roll them in the melted butter. Add the salt or cinnamon sugar mixture. Enjoy warm with your favorite dip! Last week I did not prep any meals. I also went back to work on Wednesday. Needless to say I need to have some prep done. I prepped 3 of my dinners for this week today. 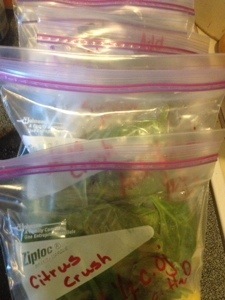 I also prepped smoothie packets for next week. Easy peasy breakfasts. All of the meals are done in the slow cooker.